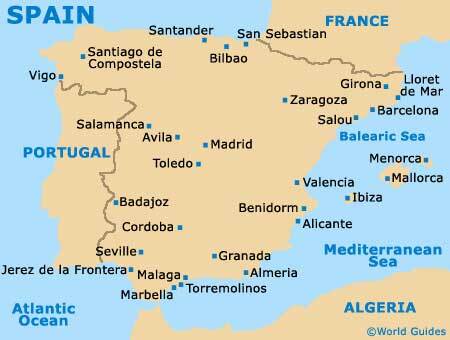 Located in western Spain, just 4 km / 2.5 miles from Portugal and to the far east of Lisbon, Badajoz is the provincial capital of the area and lies in southern Extremadura. Standing alongside the Rio Guardiana, the city of Badajoz is known both for its historic centre and industrial past. 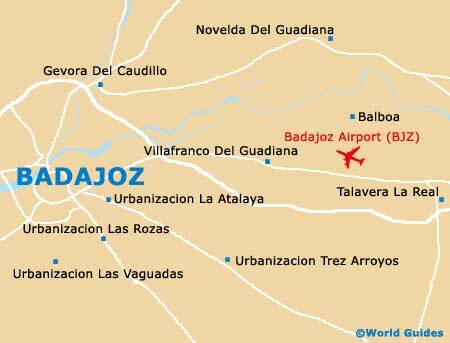 Badajoz is sited close to a number of notable towns, such as Albuquerque, around 38 km / 24 miles to the north, and the old town of Zafra, which lies approximately 72 km / 45 miles to the south-east. Also nearby, Olivenza is a medium-sized town around 24 km / 15 miles south of Badajoz, known for its rich Portuguese heritage and charming white-washed houses. The very centre of Old Town Badajoz is dominated by the Plaza de Espana, an important public square. On the western side of the plaza you will find a number of streets, lined with an impressive selection of restaurants, cafes and Tapas bars. The heart of Badajoz's commercial district stands on the southern side of the city and is centred around both the Paseo de San Francisco and the Avenida de Juan Carlos I. Sited along the Calle de José Rebollo López, the bus station lies around 1 km / 0.5 miles to the south of central Badajoz, while the train station can be found on the Avenida de Carolina Coronado, just 1.5 km / 1 mile north-west of the centre, on the other side of the Guardiana River.